We have many party formats to choose from. 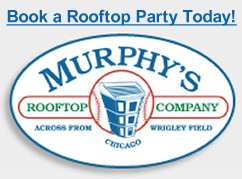 Enjoy a rooftop view of a Cubs game or your own private bar with all the fixins. HURRY! Slots fill fast. Always be reminded of the great time you had at Murphy’s Bleachers with your own piece of memorabilia. Murphy’s has been a fixture in Wrigleyville for close to 80 years. From its post prohibition origin as Ernie’s Bleachers, selling hot dogs and beer by the pail, to home of the Bleacher Bums in the 60’s, it has been both a hub of the neighborhood and a haven for Cubs fans. However, it became the legend it is today when Chicago Police Detective Jim Murphy took over. Jim had a vision that transformed an entire neighborhood. He understood the draw of historic Wrigley Field and allure of cold beer on a sunny day. Besides expanding his tavern inside and out, Jim was one of the first collectors of sports memorabilia. He also opened the first rooftop in 1984, just in time for the playoffs, sparking a movement that would come to define Wrigleyville. 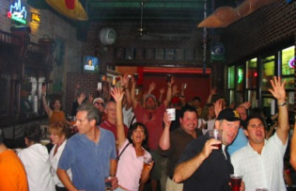 Murphy’s is still family-owned and operated, offering local craft beers and an award-winning menu. Slainte!